In coeliac disease, your body reacts to a protein called gluten, which is found in certain foods, such as bread, cereals and pasta. This reaction causes damage to the lining of your small bowel. Symptoms of coeliac disease vary a lot, making it tricky for doctors to diagnose. You can get it at any age, and many people have it for years without knowing. In the UK, around one in 100 people have coeliac disease, so it’s quite common. If you have coeliac disease you’ll need to follow a lifelong gluten-free diet. This stops the symptoms for most people. Having coeliac disease isn’t the same as having a food allergy. Coeliac disease is what’s called an autoimmune condition. This means your body’s immune system mistakenly attacks your own healthy tissue. In coeliac disease your immune system mistakes the gluten you eat for something harmful. In attacking gluten, it damages the lining of your small bowel (intestine). The lining of your small bowel is made up of tiny finger-like projections called villi. If you have coeliac disease and eat food that contains gluten, your villi become damaged and flattened. This decreases the surface area of your gut lining and stops your small bowel fully absorbing the nutrients in your food. Gluten is found in foods that contain wheat, barley and rye. Symptoms of coeliac disease can vary widely. Some symptoms may happen because of the direct damage to your bowel, some may happen because you’re not absorbing nutrients properly. Or you may not have any symptoms – many people don’t. You may only find out you have coeliac disease when your doctor checks you because you have other, related medical conditions. If you’re not absorbing your food properly, you may have problems caused by a lack of certain nutrients, for example vitamins and minerals. This can lead to you getting symptoms of conditions such as anaemia and osteoporosis. Young children with coeliac disease may find it difficult to gain weight and they may grow more slowly than other children. They may also appear more irritable than usual. Remember, having these symptoms doesn’t mean that you definitely have coeliac disease. If you or your child has any of these symptoms, contact your GP. Your GP will ask about your symptoms and may examine you. They may also ask about your family’s medical history. If they think there’s a chance you may have coeliac disease, your GP will offer you a blood test. This is to look for certain antibodies that are present in people with coeliac disease. If the tests show that you have the antibodies, your GP will refer you to a gastroenterologist. This is a doctor who specialises in identifying and treating conditions that affect the digestive system. They’ll suggest that you have a further test called an intestinal biopsy. If you have an intestinal biopsy, your doctor will explain the procedure to you, and discuss ways to make it as comfortable as possible. They’ll pass a narrow, flexible, tube-like telescopic camera called an endoscope through your mouth down to your small bowel. They’ll then take a small sample (biopsy) of the lining of your bowel. The sample will be sent to a laboratory to look for damage to your bowel. You can find out more about this type of procedure from our topic on gastroscopy. It’s important that you don’t stop eating gluten before you’ve been diagnosed with coeliac disease. If you’ve already changed to a gluten-free diet then your tests may appear normal even if you have coeliac disease. The only treatment for coeliac disease is to follow a lifelong, strict, gluten-free diet. You may find your symptoms improve within a few weeks once you’ve cut out gluten completely. Your doctor will refer you to a specialist dietitian. Your dietitian can offer you lots of support and practical help to help you manage your condition. They may suggest you contact the charity CoeliacUK, which can offer lots of practical advice. Gluten is found in foods which are made using wheat, barley or rye. It’s in bread, pastry, cakes, pasta, pizza bases and biscuits. There’s also gluten in foods you may not expect to contain it, such as most breakfast cereals and processed foods – including sausages, soups and sauces. Most beers are a source of gluten too. You’ll need to start checking the labels on foods – it should say if the product contains gluten, as well as giving a list of ingredients. See our FAQ on food labelling below for more information. After a while, you’ll probably get familiar with what you can and can’t eat. You can find gluten-free bread, biscuits and pasta in most supermarkets or health food shops. If you’re eating out and the menu doesn’t say whether the foods contain gluten, just ask. If in doubt, it’s safer not to eat something you’re unsure about. Understandably, many people find it hard to stick to a strict gluten-free diet. However, it really is important for your health – even small amounts of gluten can damage your intestine. If you have coeliac disease your dietitian may advise you to take some vitamin and mineral supplements (such as calcium and vitamin D). Discuss any supplements you’re considering taking with your dietitian. Doctors aren’t sure yet exactly why you get coeliac disease. It may run in families – one in 10 people who have coeliac disease have a brother, sister or parent who also has it. If someone in your immediate family has coeliac disease and you have symptoms, you can be tested to find out if you have it too. But having a relative with coeliac disease doesn’t necessarily mean that you’ll get it. There are other factors that some think may be involved. These include having previously had an infection in your digestive system, and having another autoimmune disease such as type 1 diabetes. If you stick to a gluten-free diet, it will reduce your risk of developing these complications. If you have coeliac disease you’ll know that you need to follow a strict gluten-free diet to stay healthy. This may seem daunting at first but as you get more experienced and learn what you can eat, it will get easier. A dietitian can help you plan your gluten-free diet. You can also eat any processed foods that don’t contain gluten. Check the labels on the packaging and see our FAQ on food labelling below. If you look in the supermarket you’ll see that there are often lots of gluten-free alternatives to bread, cereals, pasta, flour, crackers and cereal bars. Your dietitian or specialist nurse will give you lots more information about what foods and drinks you can have and which you should avoid. There’s also lots of information available online from organisations such as those in our section ‘other helpful websites’ below. Coeliac disease is a lifelong condition, so it’s recommended that you have regular check-ups (once a year) with your specialist nurse, dietitian or doctor. They’ll ask you about any symptoms you have and how you’re getting on with your gluten-free diet. A child or teenager will have their height measured to make sure they’re growing properly. You may need blood tests to check your health and to see if your body is absorbing enough nutrients. Because of the risk of getting osteoporosis, from time to time your GP may recommend that you have a dual X-ray absorptiometry (DXA) scan. This checks the density of your bones. See our topic on osteoporosis for more information. Coeliac disease can sometimes mean you’re less able to fight infections. Your GP may suggest you have the annual flu vaccine and the pneumococcal vaccine which protects against some types of pneumonia. If they recommend you have other vaccinations they’ll explain why these might be important in your particular circumstances. It can be hard to stick to a strict gluten-free diet, but it’s really important for your health. As well as your dietitian or GP, your family and friends can give you support if they understand what a gluten-free diet involves. Charities and patient groups that focus on coeliac disease can be a good source of support and advice to help you manage your condition. See our section on other helpful websites below for contact details. What if I accidentally eat food with gluten in? What if I accidentally eat food with gluten in? It may sometimes be difficult to follow a gluten-free diet and mistakes can happen, especially when you’re just starting. If you eat gluten, the reaction you have will depend on a number of things. These include how severe your symptoms have been in the past and how much gluten you’ve eaten. You may get symptoms starting a few hours after eating, and these could last for a few hours to several days. But everyone with coeliac disease will react differently and you may find you don’t have any symptoms at all. However, your body may still be affected and this could damage the lining of your small bowel. It’s important to always check what you’re eating and always follow a gluten-free diet. What should I look for on food labels? What should I look for on food labels? If you have coeliac disease, it’s important that you become familiar with food labelling so that you can avoid sources of gluten. Foods labelled ‘gluten-free’, ‘very low gluten’ or which have the Crossed Grain Symbol are generally safe for most people with coeliac disease to eat. ‘Wheat-free’ doesn’t necessarily mean gluten-free. There’s a law covering how food is labelled in the UK. This includes all food, no matter where it’s sold, be it in any type of shop or supermarket, or in a restaurant or cafe. If food contains grains with gluten they should be shown in bold letters in the list of ingredients – for example wheat, barley or rye. If you’re in a restaurant you may have to ask the staff about the ingredients of the food. Look out for foods labelled gluten-free or very low gluten. Foods labelled gluten-free may contain traces of gluten – this is defined as less than 20 parts per million of gluten. Foods labelled ‘very low gluten’ are made with a special type of modified starch. They contain a little more gluten than gluten-free products (up to 100 parts per million). Some foods may be labelled with the Crossed Grain Symbol, which is licensed by the charity CoeliacUK. These foods are gluten-free. Supermarkets may also have their own symbols to show that food is gluten-free. Foods labelled ‘wheat-free’ aren’t the same as ‘gluten-free’ or ‘very low gluten’. Wheat-free foods may have other cereals, such as barley or rye in them. These contain gluten, so they aren’t suitable if you have coeliac disease. If you’re in doubt as to whether something is safe or not, it’s best not to eat it. Ask your dietitian for further advice and information. Is coeliac disease like wheat allergy? Is coeliac disease like wheat allergy? Coeliac disease is linked to wheat because wheat contains gluten and it’s gluten that causes the symptoms of coeliac disease. But coeliac disease isn’t the same as wheat allergy or wheat intolerance. If you have coeliac disease, your body’s immune system mistakes gluten for a harmful substance. In attacking gluten, it damages the lining of your small bowel. True wheat allergy is thought to be very rare, and it affects children more than adults. Like coeliac disease, it involves your immune system reacting but in a different way. This tends to happen very soon after you eat wheat. It’s not the same as coeliac disease but it can cause similar symptoms, such as abdominal (tummy) pain, vomiting and diarrhoea. Wheat allergy-related symptoms might include a blocked or runny nose, feeling short of breath, itchy and watering eyes, hives (itchy rash) and swelling. You’ll generally only have symptoms for a short time after eating wheat (a few hours), though occasionally they can last for longer. A food intolerance is when you get unpleasant symptoms after eating certain foods, but these don’t involve your immune system. If you have wheat intolerance you may find that you get symptoms such as bloating, wind and tummy cramps after eating wheat. Although these symptoms are similar to those you may get with coeliac disease, they are not caused in the same way. They may be caused by bacteria in your bowel reacting to what you eat. 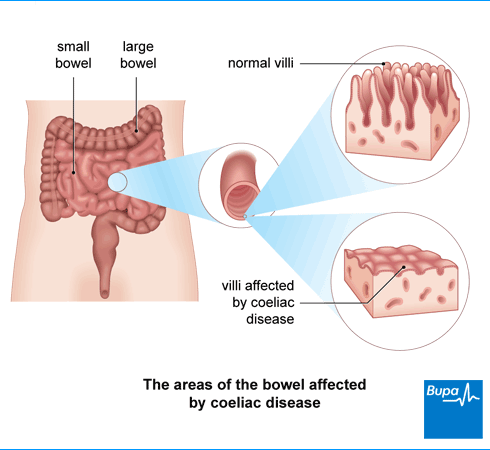 Wheat allergy and wheat intolerance don’t damage the lining of your small bowel in the way coeliac disease does. If you find that you are getting unpleasant reactions to eating wheat, contact your GP. Can I eat oats if I have coeliac disease? Can I eat oats if I have coeliac disease? Oats contain avenin, a protein similar to gluten. Most people with coeliac disease can safely eat avenin. Problems can occur if oats are produced in the same place as wheat, barley and rye, as the oats can be contaminated with these. Only uncontaminated oats can be eaten by coeliac patients. Oats that have been tested to make sure that they’re not contaminated may be labelled ‘gluten-free’. A very few people with coeliac disease may still be sensitive to gluten-free, uncontaminated oats. If you’re unsure about eating oats, your dietician can give you more advice about this. Gluten is the name given to the proteins found in certain cereal grains.